Proyecto Chimiya is an educational and ecological park spanning approximately ten acres in a rural community near San Juan Comalapa, Guatemala. The park consists of a community garden, a tree nursery for reforestation, a community kitchen, a soccer field, nature trail, basketball courts, and a community pavilion. All of the programs offered serve the community and schools daily, free of charge. While all these programs were taking place, one component was missing: water. The site had a 9,000 gal holding tank, but the pump to fill the tank was not useable and the 200 meters of distribution line were insufficient. In addition, the park was paying a local farmer to fill the tank from a polluted ravine with a 10 hp gas pump. This practice was expensive for the park and clashed with the environmentally responsible message they are trying to put forth. 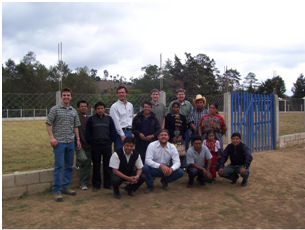 In March of 2006, two EWB-UMN members traveled with two members of the Minnesota Professional chapter to San Juan Comalapa to complete the assessment phase of the project. A survey of the site was conducted, with extra detail to the elevations of potential water line routes for pump sizing. Water samples were taken at a stream where water was being drawn from as well as a spring nearby. Samples were put on ice and brought back to the US and were analyzed further by Braun Intertec. The testing indicated the presence of pesticides and elevated nitrate and nitrite concentrations in the stream. 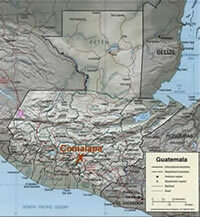 After returning from the assessment trip, work began on the design of a new water system for Proyecto Chimiya. The design process involved the professional chapter and students, a group that had expertise in many disciplines, experience, and enthusiasm for the project. Pump sizing began immediately and a ¾ hp power pump was identified to handle the 130 ft of vertical head and losses in the 200 m long line. The complicated part of the pump system was the power source. After much correspondence with Chuwi Tinamit and the local power company, an agreement to bring power to the site was reached. The decision was made to construct a sump box adjacent to the spring box that would hold a submersible pump. A valve located in the holding tank turns off the flow of water when the tank is full. The rise in pressure in the supply line then trips a pressure switch relay and turns the pump off. An adjustable timer then determines when the system should try to turn on again. If the tank is full, the pump shuts off again, if not, it will pump until full. In January 2007, eight students and four professional engineers traveled to San Juan Comalapa to see months of planning come to fruition. The community opened their homes to our group and worked with the team side by side. Days were filled with digging, pouring concrete, pipefitting and experiencing the local culture. On the second to last evening of the trip, the pump was switched on and water flowed to the tank. The community set off fireworks and hosted a special celebration for the collaborative efforts of Chuwi Tinamit and EWB. This marked the successful completion of our first project.